You can see some of my peppers behind the giant bowl of tomatoes (5 varieties of regular-size tomatoes and a yellow cherry tomato that is really yummy, SunSweet I think it is). I’m also getting a fairly steady supply of zucchini and cucumbers, and my green beans did well although I didn’t really eat any, I just admired the vines (which you can see on the left of the photo). For some reason I didn’t feel like harvesting them. I still have some going, I should get a bowlful this weekend and have some while they’re still available. Potatoes are still growing; hopefully they’ll start to die back soon and I can see what’s been growing. I keep feeling around for “new” potatoes but haven’t found any, which worries, me, but the plants on top are really big and green, so… Anyway. Also doing well is the basil, and my other herbs. And I stil have some oranges. Kombucha: my brother and his wife make batches of this all the time, and got my mom to make some too, and it’s really good homemade. So I decided to try it. Right now my scoby is growing and doing well. I think I’m going to let it get a little thicker before I try making a batch. I can’t wait! I think my favorite part is going to be going to the homebrew store to get flip-top bottles. Plum liqueur: I made a big giant batch of plum liqueur during the Plum Crazy Days. It’s doing really well, and looks beautiful. Tastes yummy too. Vinegar drink: My BFF Erin turned me on to Bragg’s vinegar drink (sold in glass bottles in health food stores). It’s of course, well, vinegary, but I kind of liked it. A few weeks ago I bought another bottle and liked it even more than the first time, so I looked at the ingredients. It’s just Bragg’s vinegar, water, stevia and (in this case) ginger. So I figured it could be made at home pretty easily. Erin tried it and said it was good. I happened to have a Snapple bottle today, and it’s about the size of the Bragg’s bottle, so I thought I’d give it a try. Success! Two tablespoons Bragg’s, two little scoops of Trader Joe’s stevia, and fill it up with water and shake. Ta-da! Vinegar drink. I made one tonight to take to work tomorrow. Might have to do that regularly. Painting: well, not really homemade, but I finally painted the ugly office. Now, instead of boring white with a bizarre tan stripe around the room, it is a lovely creamy light yellow (Windham Cream, from Benjamin Moore, color-matched in Valspar paint). I’ll try to get a photo of that. It took me a few days to get used to it and now I really like it, and am considering painting the third bedroom that color as well. I think that’s it. I have really not kept up with the yard all that much — it’s doing okay, but it’s really overgrown in areas and I have a lot of work to do. I think it will be cooling down over the next few weeks so I can get some work done — it’s hard to muster up energy to cut branches and trim back trees and brush and do weeding when it’s over 100 degrees out there. That seems like autumn work anyway, right? While I don’t like short stories (generally speaking, with a few notable exceptions), I do like essay collections. 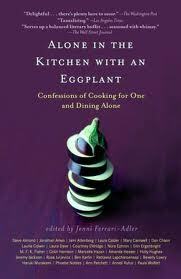 This was a good one — various authors, including Nora Ephron, writing about eating alone. Meals, cooking, eating — what do we cook and eat when we’re by ourselves? Obviously too many to talk about here, but many of these were really enjoyable, especially the first one, from which the book takes its title. The author, living in a miniscule apartment in Greenwich Village, cooks wonderful meals for herself, often involving many iterations of eggplant, and entertains an ever-revolving cast of guests in her small, barely-a-room apartment. From there, we learn about legendary family recipes cooked for oneself, all-white meals consumed at home alone, cold beans eaten out of a can, elaborate restaurant meals eaten proud, or hidden behind a book. I loved most of these — it was highly enjoyable. 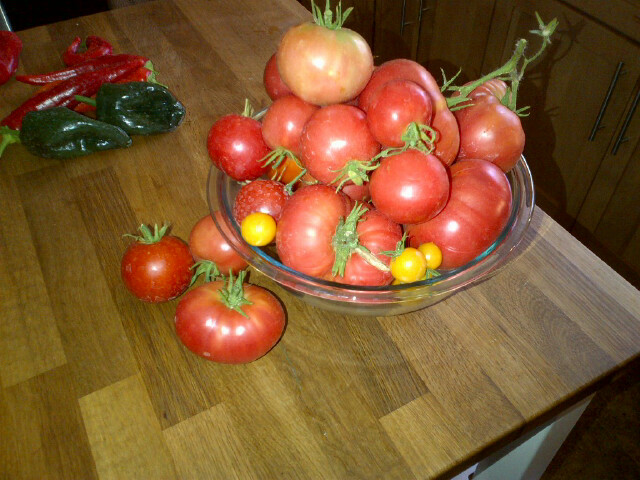 I can eat plate upon plate of tomato and cucumber salad, especially when they’re fresh from my own garden. With dressing, or without. With salt and pepper and vinegar and oil, or plain with lemon pepper. Although convenient; I don’t like eating cereal for dinner. I always end up with a stomachache for some reason. The soymilk? I have no idea. Anyway; I’ve pretty much given up eating cereal (at all) for that reason. Oatmeal, however — totally fine, and a lovely meal anytime. Toast is a perfectly acceptable dinner. I vacillate between extremely simple meals (tomato-cucumber salad, sauteed vegetables and brown rice) and fairly elaborate casseroles and other one-dish meals. Sometimes I like to cook something a little more ‘special’ for myself. Not often, but sometimes it’s fun to find something interesting in a cookbook or blog and make it for myself. Last night it was homemade mac-and-cheese with assorted add-ins. Delicious. Also handy for lunches. I don’t like frozen dinners or many pre-prepared foods. I’d rather have toast. Cheese and crackers also totally acceptable. I like a little dessert. Especially I like ice cream. I don’t particularly like having ice cream at other people’s homes, but it’s the perfect at-home, private dessert. You can have a lot or a little, you can do whatever you like to it, there’s lots of variety available, and it keeps in the freezer for a very long time (important because I don’t want it *all* the time…). When I was growing up, we almost always had ice cream in the house (usually homemade); for that reason it’s somewhat of a comfort food for me now. Upon reflection, not too bad. Lots of veggies, not a lot of processed food, a little ice cream. There are worse diets. I like to either eat at the table with a book, or on the couch with something on Netflix. I rarely watch regular TV. I do my dishes every night (well, almost). My fridge is usually bordering on bare, but I try to keep some kind of fresh vegetables, some cheese, and eggs at all times. Omelets are also pretty good one-person meals. I like eating with people too — it’s way more fun to cook for someone else. However, it’s definitely been good to have this time to figure out what I like, all by myself. Sooo behind on book reviews. However, just for posterity, here are some mini-reviews of what I’ve been reading. The Marriage Plot: meh. I didn’t love it. I liked it, it was kind of interesting, but I really didn’t care about any of the characters, didn’t really feel there was all that much of a plot, and it was pretty obvious that neither guy was great for her, so…. what was the point, again? My book club felt the same way. The White Devil: I liked this quite a bit. It was pretty creepy in the beginning, and then as the book went on, it was a nice mixture of creep, mystery, lit-history and English boarding school, all things I like. It also did not really have a happy ending, which I appreciated. Ghostly apparitions, Lord Byron lore, tuberculosis, abandoned cisterns, disaffected youth… what’s not to like? Across The Nightingale Floor and Grass For His Pillow: These qualify as samurai-adventure stories, I guess, which is a first for me. I listened to these on audio and they were quite good, at least via audio. The readers were great and the story blended ancient Japan, samurais, mythology and a bit of fantasy (but just a wee bit), plus some really heartfelt romance. I have a feeling they would be a tiny bit cheesy in print form, but as audio, they were really engaging and I loved all the characters and the backstory. A little sparse on the hows and whys, but great pensive mood and really interesting details from Japan of long long ago. I think that’s it? It always seems like more when you’re actually reading the books. My next book is The Happiness Project, which I’ve heard mixed reviews on. I’m more curious than anything — I feel like I’ve got my own formula for happiness and I’m working on it daily, but I feel like so much of the self-help industry for happiness is utter BS designed to actually make you more unhappy and feel even more inadequate than you already do, so I’m curious what she has to say. And in other news, I made orange marmalade today and it is AWESOME. I’m making more next weekend, and possibly another batch after that. It’s just that awesome. 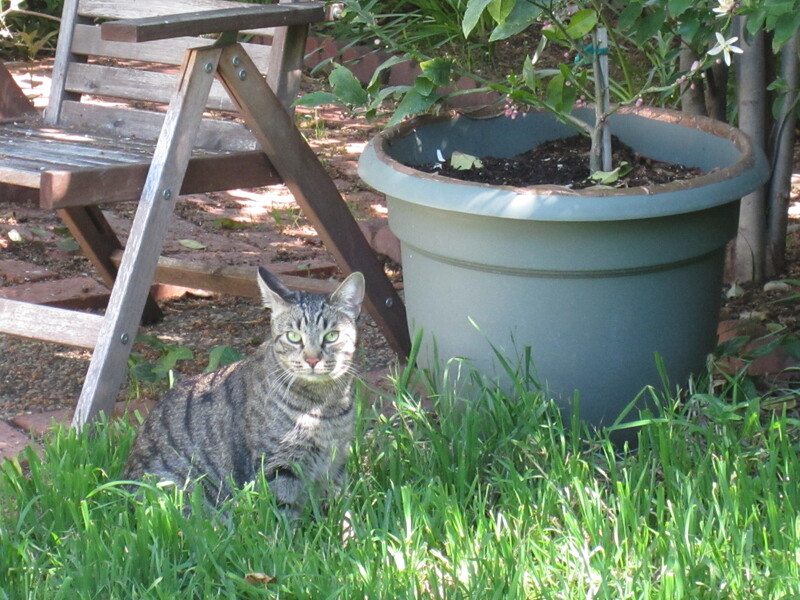 Thomas will be guarding the lemon tree. This week was better. Not amazing, not great, but definitely better. I’ll consider this a trend and continue thinking optimistically. Chelsea. I’m going to see her for the first time in six months. I will probably cry my eyes out but I miss that doggie, and I need to see her. We’ll go to the park for a few hours. Music. After crying my eyes out over doggie, I will go see a friend’s New Wave cover band at a local sports bar. People, it does not get better than that. Reading. We Need To Talk About Kevin. Preferably in the hammock. Designing my brother-and-his-fiancee’s wedding invitations. Love! Possibly a hike. This incredible video and photography was taken about 15 miles from my house. I would love to see this. Gardening. The potatoes are going crazy. Everything needs some inspection, thinning, etc. 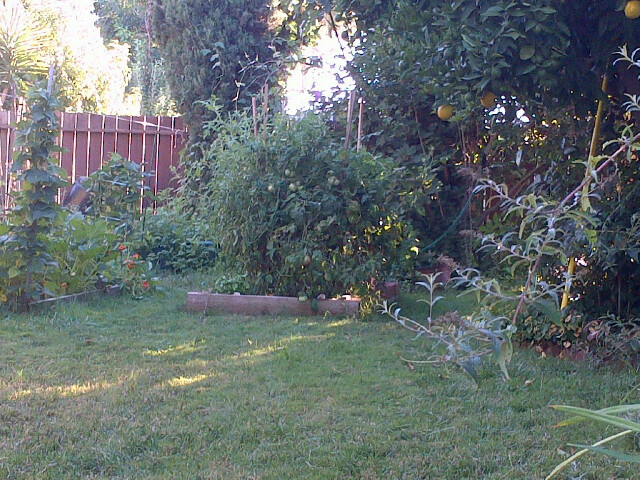 And weeding. Library. I have a bunch of books about succulents waiting for me. I am SO EXCITING. I know, please don’t be jealous. Less chores. I’m going to try and either condense or skip most chores again this weekend. Relaxing is good for me, I think. Am working my way through some good recipes in the Moosewood Cookbook. Last week is was Mushroom Curry (super yum, especially the next day). Tonight it’s Solyanka, basically mashed potatoes and cabbage. It’s really kind of good. Trying to cook more. Oh, and I made fresh strawberry ice cream, since my neighbor gave me six pints of strawberries last weekend. What? I had to use them up! Oh, it is a dangerous thing to be home alone on a Saturday night. 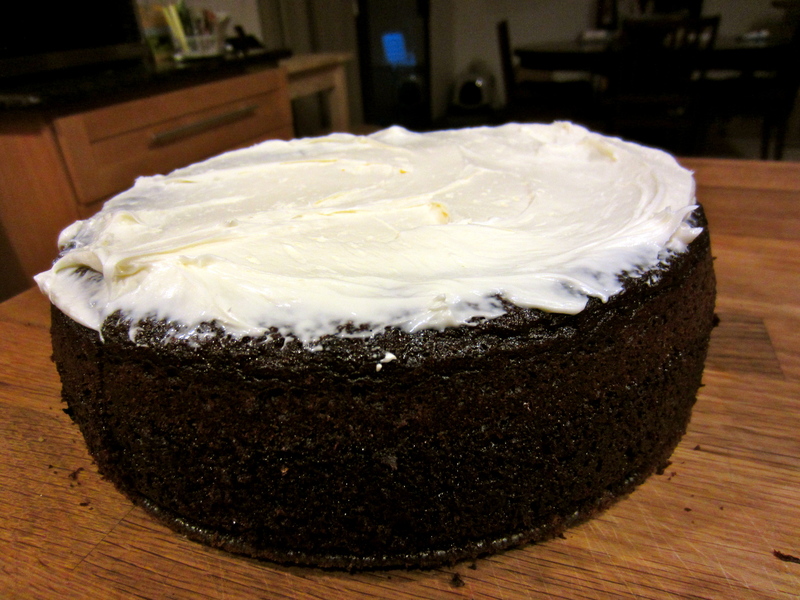 What to do… what to do… I know, I’ll make a huge chocolate cake! For me. One person. Yep. Oh well. Actually I can probably feed this to a few people over the next couple of days if I’m lucky, and then take the rest to work. In related news: I really need to get out more. Monday I totally Hit The Wall and was achy and tired and felt exhausted and starving. So I thought pizza sounded like a good dinner. Because I can’t bring myself to order delivery (it always seems to cost $30, which seems excessive for lazy dinner for one), I went over to the take-and-bake place. Turns out, a $10 family size pizza from Papa Murphys is HUGE. Like, I could barely carry it. It wouldn’t fit on the front seat of the car! I had to put it on the floor to get it home! I almost needed an extra person to help me carry it into the house! Like, it WOULDN’T FIT IN MY OVEN. Seriously. It didn’t fit in my oven. I don’t have a small oven. This was just a REALLY BIG PIZZA. Yeah. So I ate ONE PIECE and was so stuffed I could barely move. Oh! And then after I baked the pizza, I realized that the bottom crust was all soggy (ew) so I was going to put them back into the oven to crisp, but by then I’d already cut the slices. So I put the slices on my bread-stone to crisp, and they wouldn’t fit on that either (even though it’s cookie-sheet sized), so I had to do it in two batches. They looked like sea lions, all the slices flopped over on top of each other, baking in the oven. So I’ve been eating pizza alllllllllll week. Sunday, I made brownies. Usually, the recipe I use is my favorite. This time, however, for some reason the brownies puffed up like a Dutch-baby pancake. Puffy brownies! What?! I ate some but they were just Not Right. So I ended throwing them out. I think I put in baking powder instead of baking soda or something. Clearly my head hasn’t been working very well for a few days now. So yeah. I think it’s time I started cooking again, don’t you think? I have been CRAVING French Onion Soup for about three weeks. Today I decided to make it. OMG, so good. This is the best onion soup I’ve ever made — the flavor was so amazing. I made notes about what I did and I gladly pass them on to you. Note: the soup was so good that you could eat it without the cheese if you wanted. 1. Gather your ingredients. You should have about 2+ hours until dinner; this soup takes a while to cook. 3. Scrape all the cut onions into a bowl. You will have at least 6 cups of chopped onions — probably more. 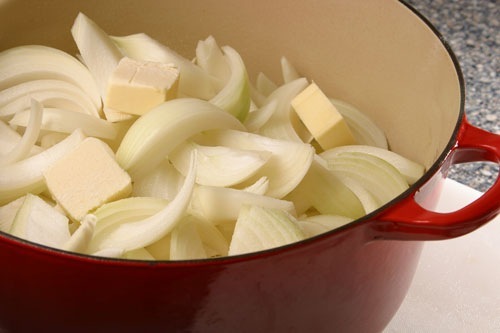 Don’t worry too much about quantities with this recipe; if you have an extra onion to use up, throw it in! 4. Cut a stick of butter in half, and then into a couple of big pieces. 5. Place your skillet or saucepan over medium heat and add the butter. Let the butter melt. 6. After the butter melts and foams up, add the onions. Stir them to coat well with butter, and sprinkled them thoroughly with about a teaspoon of salt. 7. Turn the heat to medium low, and let the onions cook. Let them cook, stirring occasionally, for at least 45+ minutes. You can let them cook even longer — an hour and a half will give you deeply caramelized onions! Just let them cook, stirring at times, as you see dark color emerge. After 45 minutes they will look pale mahogany in color, like in this photo. You can let them get even darker if you like — just don’t let them burn or get black. Adjust the heat as necessary. 8. Once they are starting to brown (about 45 minutes in) add balsamic vinegar, brown sugar, paprika and brandy. Let cook down another 15 minutes or so. Then add herbs, if using. 9. As the onions reach a dark brown color, pull out your stock. 10. Pour in the broth and 1 cup of white wine, and turn the heat up a little so the soup comes to a boil. Turn the heat down again and let it simmer for at least half an hour — longer, ideally! 11. Simmer until the soup has reduced a bit and is shiny and glazed over the onions. 12. Toast the bread. Once toasted, spread with a thin layer of dijon mustard. Ladle soup into oven-proof bowls, top with the mustard-toast. Pile on the shredded cheese if using, and broil briefly until the cheese is melted and light brown. Vacuumed. Mostly I wanted to get the nap of the carpet back to where it needed to be after I cleaned it. Also I’ve been cutting mats out of Finn’s hair and he’s been leaving clumps laying around. Poor kitty. Bought some houseplants. Am going to attempt to keep the Boston fern alive. It looks so pretty up on the kitchen cabinet tops… I hope I can keep it alive. Went to Comcast to get basic cable box. I haven’t had regular TV since November and haven’t really missed it, but I kind of miss the news now and and again and basic cable is included with my internet service, so why not, right? Had to go back to Comcast because of faulty cable box. Discovered that it’s not the box’s fault at all. Now have appointment for Comcast guy to come on Monday morning. Have I mentioned before how much I hate Comcast? While out, decided that sitting on the couch for the rest of the night and reading a Harry Potter book sounded like an excellent idea. So went to the library, where they have, I swear, 15 copies of each of the Harry Potter books on the shelves. So satisfying. I’ve been listening to the first four books on audio and the narrator is really fantastic, but I just can’t get enough. I’m half-way through the 4th on audio, but since that’s a re-read and I know what happens, I’m skipping ahead to read the paper copy of the 5th. So will be reading two Harry Potter books at once. This is only my second time reading the last four books, so it’s a real pleasure to experience them all over again (have read the first three at least 3-4 times for some reason, but not the rest). Finally settled down, and have been reading Harry Potter, eating soup, and petting the cat for the last hour. Yeah. So I need to work on that laziness thing. Maybe tomorrow. Among all the things I am welcoming back into my life, food is surprisingly causing me some consternation. For the past five years, our diet had been getting more and more restricted. I like exploring food and cooking so at first I welcomed the push for more nutrients (this was about five years ago, I guess). Juicing? Sure! More vegetables? Right on! But then the restrictions started: Much less dairy (not really a problem). Lower sugar (fine, okay). We were already vegetarian so meat was not on the table, but then soy got cut out. Hmm. Then corn. Then almost all fat (which is really hard to do when everything else is so restricted). Then most grains, then we went gluten-free. Then the vegetables started getting restricted. No cruciferous veggies. Low roughage, but high fiber. Then extremely low fiber. No eggs. High salt. This became a problem for me: what the hell to fix to eat? During the last year, I am not sure what we ate other than, no joke, quinoa. That’s the main staple I can remember. Sometimes some peppers, maybe? Other than that, I have no recollection of anything else being prepared. But just quinoa, with or without vegetables, with or without anything else on it. That’s… not very balanced. I was not happy about this but T. had all kinds of digestive issues and although I really think we should have seen a nutritionist or something, there were all kinds of reasons not to do that as well. So I did the best I could, which really wasn’t very good, and we weren’t eating very well at all. I had no idea what to do at that point. Anyway, so now that’s not a problem in my life. I can eat whatever I want, and have been, for the past two months, once I got over the initial part of the terrible cold. This has been fun. I go to the store, look at everything, and just get whatever seems good. A miracle! Thankfully I lean towards healthy options anyway, but still, it’s nice to be able to choose whatever I want, whatever seems like a tempting option at that particular moment. Now I’m starting to settle into a “new normal” and am having trouble figuring out what I need to eat on a regular basis. I’m still feeling somewhat low-energy and I have trouble concentrating (although that’s getting better). I feel like I’m drugged when I wake up in the morning, and my eyes are puffy when I first get up (which has never been a problem for me before). As I’ve been adjusting to feeding just one person, I’ve been leaning a little bit on pre-prepared foods (knowing that this was always only a temporary solution as it goes against everything I hold dear!). I’ve been drinking a little more alcohol, maybe one-two glasses of wine a week (since I hadn’t been drinking at all, anything is more than what I’d been drinking). I went on a temporary meat adventure, thinking maybe I needed more protein and iron to recover from everything. I’ve been eating out more, too, as I’ve been more social. I’ve been eating more, in general, although I don’t notice that I’ve gained weight – I lost quite a bit when I was sick, so maybe now I’m just back to normal. I am, at heart, the Queen of Moderation, so now it’s time to figure out What The Heck To Eat, that will help me get my energy and concentration back, keep me at my regular weight, and also taste good and allow me to get back into cooking. I’ve discovered that I like a glass of wine sometimes. Not every night. Not even most nights. Just sometimes. Same with any other alcohol. I had a good time trying all kinds of things for a few weeks, but now I’m settling back into my old self and I don’t need much alcohol in my life. But it’s nice that I can. I will remain my usual mostly-vegetarian. That has worked for me for the past 18+ years. I just don’t love meat, for all kinds of reasons. I do need more protein, though. I feel better when I have more protein. So welcome back, tempeh! I think I’m going to try and bring two pieces of fruit with me to work every day and eat those before I have any other snacks. I’ve been doing that this week and it’s been nice. Also, a banana on the way to work and a pear for a snack, are pretty tasty. Starting this weekend, I’m going to try and have a giant portion of veggies every night. I’ve been working my way back to this and have had huge portions of haricot verts the last couple nights. So delicious, with some smoked salt and a little bit of Earth Balance. Yum. I have discovered that my bread addiction has been broken, over the past two-three years of severe wheat rationing. I don’t need to invite that back. So I’ll limit bread/baked things. Although sometimes it’s fun to make these things. I’ve always had a fairly healthy diet, and I almost always choose whole-food healthy options, so I’m not too worried. However, I’ve been off-kilter the last couple months, and just need a few reminders to get me back to a new healthy normal diet. This DOES mean that I get to try all kinds of new vegetable recipes, though! Today was good, but kind of a lesson in a) not taking things too seriously and b) really getting over being a perfectionist about some things. So I decided to make myself some warming, blood-strengthening food. I was thinking greens, but I was also thinking curry (warming spices!). So I decided on saag paneer. I made the homemade paneer cheese (so easy) and made my own masala (in the coffee grinder) and cooked all the greens down… and it was delicious, but it looks like vomit, and is so filling that I could only eat four bites. So. Hmm. I also decided that I wanted to bake something. Coffeecake sounded good (when does coffeecake NOT sound good?). I used a Cook’s Illustrated recipe and made this really amazing blueberry-lemon coffeecake with cinnamon-walnut streusel. Well, it tastes amazing. 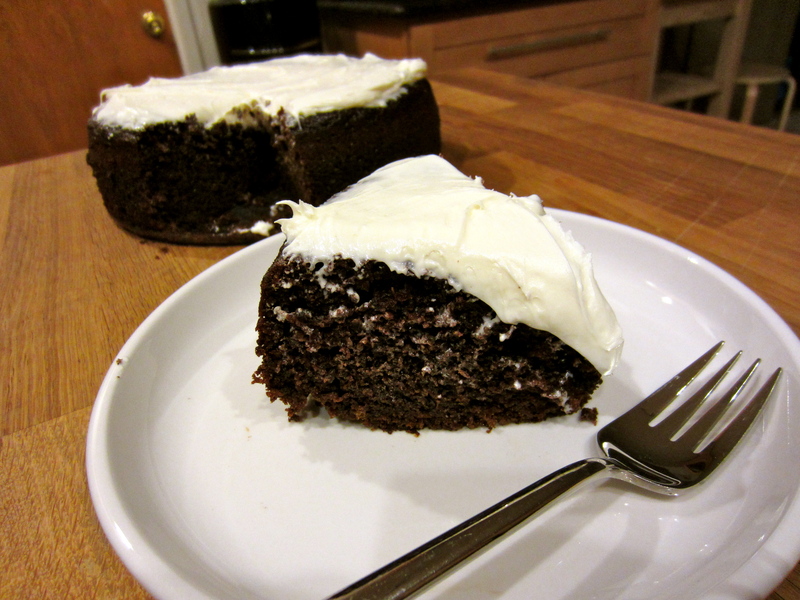 Unfortunately it totally fell apart when I took it out of the pan, and it’s not a very attractive cake. I’ll take a photo tomorrow. It looks like a really, really sad 4-H entry. But it does taste really good. Unfortunately I was so full from my four bites of saag paneer that I could only have a few bites of the cake. However, it’s so yummy that I nicknamed it the Coffeecrack. Related: In keeping with the “low-key exercise” model, I wanted to ride my bike to the store to get the ingredients for the above recipes. Which sounds like a great idea, right? Except that my bike tires were totally flat, and I couldn’t find a key that fit the bike lock. So I looked and looked and finally found the key. Then I walked the bike to the gas station to get the tires pumped (no, I don’t have a tire pump and yes, I’m going to fix that problem soon). I filled the tires and rode to the store, which is all of about a half-mile away. Was smug and proud of myself as I shopped, happy about doing my part to save the earth and all that. Then I get back out to my bike, and of course the back tire is about half-flat. Because Save The Earth Girl hadn’t ridden her bike in over a year and didn’t realize the back tire doesn’t hold air. So… I *was* going to ride to the library but instead I went straight home on half-flat tires. Sigh. All in all I think today was mostly successful, although everything was sort of skewed in some way. But everything turned out okay in the end and I think I can finish my book tonight; go, me! Photos tomorrow, promise.